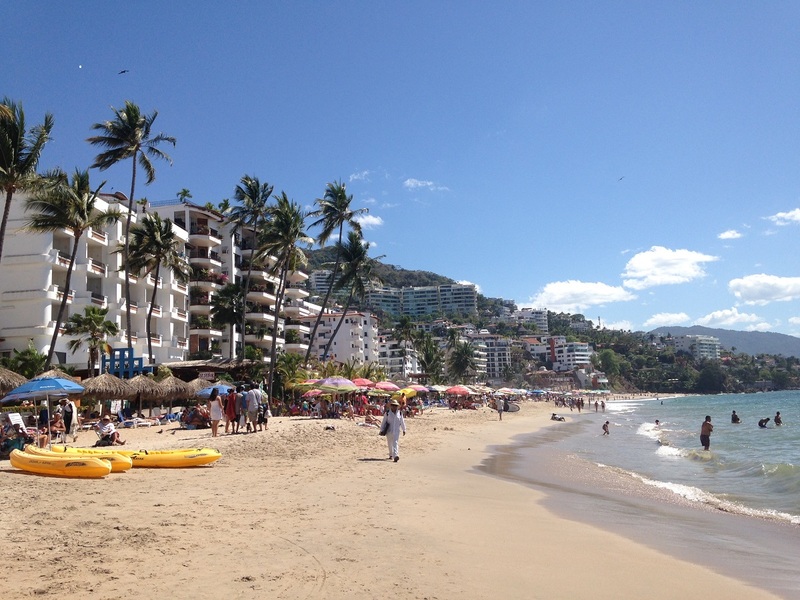 Playa Los Muertos is Puerto Vallarta’s “happening” beach. The name Playa Los Muertos translates to “Beach of the Dead” which was the name given to this beach after Pirate raids on the native population resulted in massacres along the beachfront in this area. But during modern day times there is nothing “dead” about this beach. Playa Los Muertos is full of hustle and bustle and lively activity. It is by far the most frequented area of beach along the entire coast. In my book, a visit to this location is an absolute must for all visitors to Puerto Vallarta. All along Los Muertos Beach vacationers will find plenty of opportunities to participate in fun beachfront activities such as parasailing, banana boat riding, jet skiing, swimming, beach volleyball, and sandcastle making. A wonerful series of beachfront restaurants and bars line the beach area, with others just a short distance up from the sand. And if you don’t have a beach chair or umbrella, there are several eateries along Los Muertos Beach where you will be allowed access to their loungers beneath palapas or umbrellas in return for ordering food and drink. But every evening, gorgeous sunsets are free of charge! Another wonderful feature of Los Muertos Beach is the stream of beach vendors selling silver jewelry, wood carved accessories for the home, beach cover-ups, colorful blankets and beach totes, bakery cookies and muffins, and a whole host of darling souvenirs and gifts to take back home. You can literally sit back on your beach chair or towel and just shop, shop, shop. Other beach vendors offer services such as hair braiding, massages, and Henna tatoos. At Playa Los Muertos talented musicians stroll by offering to play music for a tip. And if you enjoy people watching, this is definitely the beach for you. A unique mix of tourists, locals, expats, gay, straight, and plenty of eccentric characters all blend together giving Playa Los Muertos a really fun and festive vibe.